Can a bluegrass band come from someplace other than the deep south (try Burlington, Vermont) and still attract the attention of bluegrass traditionalists? You bet! Breakaway has won published acclaim from the Southeastern Bluegrass Association and Bluegrass Now. "Everything this band does is exceptional. Their instrumental work is masterful; it's inventive and interesting yet tasteful, nothing lacking or overdone. Their lead and harmony vocals draw on the talents of three good singers who all stand out on lead and blend well on harmonies. Breakaway's sound is progressive, yet it also has a real traditional ring to it." That remarkable blend has earned them first-place honors at the Winterhawk Band Contest, and they were semifinal ballot nominees for the IBMA Emerging Artist of the Year and showcased at IBMA. The annual music critics' "Best of..." picks for 1997 at no less than the Chicago Tribune included Breakaway. Says David Royko: "Breakaway is the real deal. They cover all the bases--writing, picking, singing--with skill as well as originality." Their "Watershed" CD on the Signature Sounds label began attracting the media attention as well as world-wide airplay, and their newest recording is expected out in the spring of '99. But live performances are the freshest opportunity to experience the burn and the energy of intense, masterful bluegrass. Breakaway's warmth and audience appreciation has made this band one of the most beloved of the frequent festival participants. Bill Knowlton, 1997 Broadcast Personality of the Year, captures their appeal: "We bluegrass fans in the Northeast can be very proud that we have Breakaway to play for us the music we love. 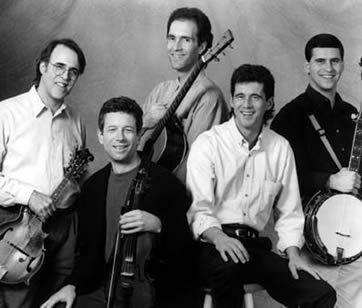 The group can steep itself in tradition or introduce to its audiences a flow of new bluegrass songs that toally respect the roots of the music. Breakaway's Andy Greene composes contemporary bluegrass ballads that must be listened to and taken very seriously. But whether it's a Ralph Stanley evergreen, a banjo tune by Scott Hopkins, or an oldtime gospel hymn, Breakaway sings it, performs it, and sells it to an audience with talented showmanship and professionalism. You've got to love a band whose motto is, "Better Living Through Bluegrass."